Through a series of recent breakthroughs, deep learning has boosted the entire field of machine learning. Now, even programmers who know close to nothing about this technology can use simple, efficient tools to implement programs capable of learning from data. This practical book shows you how. 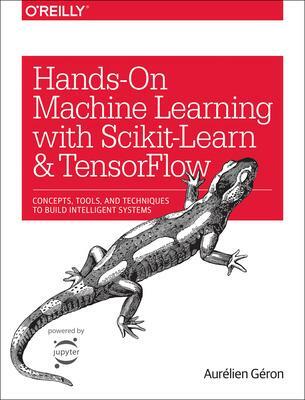 By using concrete examples, minimal theory, and two production-ready Python frameworks-scikit-learn and TensorFlow-author Aurelien Geron helps you gain an intuitive understanding of the concepts and tools for building intelligent systems. You'll learn a range of techniques, starting with simple linear regression and progressing to deep neural networks. With exercises in each chapter to help you apply what you've learned, all you need is programming experience to get started. Aurelien Geron has worked as a software engineer for a consulting firm in Paris, an IoT startup in Montreal (back in 1999! ), and has also worked as co-founder and CTO of a leading wireless ISP in France (Wifirst). He was the product manager for YouTube's video classification team.He has authored a WiFi book, a C++ book, and taught CS in French engineering schools. A few personal fun facts: Aurelien grew up in France, Nigeria, New Zealand, and the U.S. (Berkeley). He studied microbiology and evolutionary genetics before going into software engineering. He was the singer in a rock band, has 2 turtles and 3 hens, has scuba dived with 10-foot sharks, taught his 5-year-old son to count in binary on his fingers (up to 1023), and his parachute didn't open on the 2nd jump.